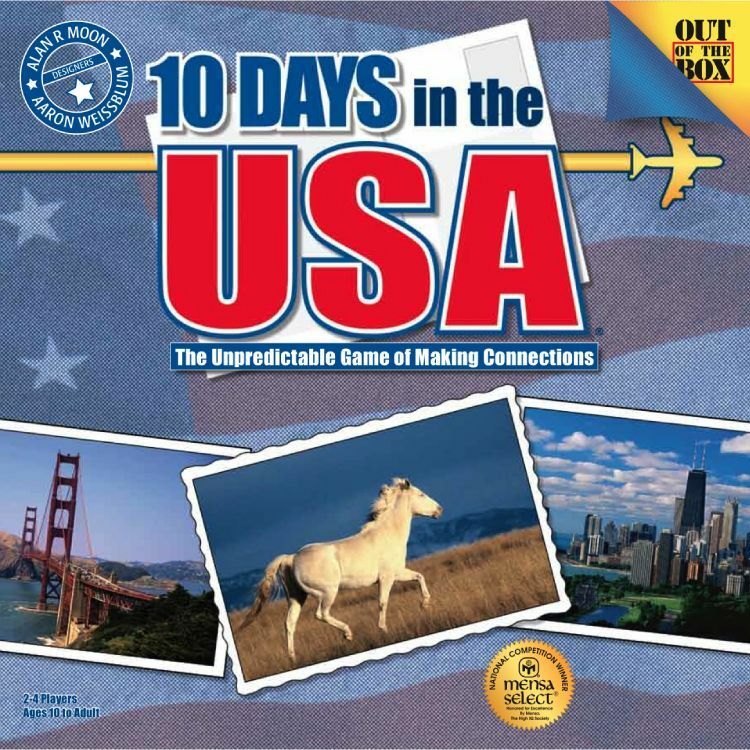 You have 10 Days in the USA. Travel the country by jet, car, and on foot. Plan your trip from start to finish using destination and transportation tiles. With a little luck and clever planning, you just might outwit your fellow travelers. This is the first installment in the 10 Days in series. There are 50 state tiles, 10 colored airplane tiles, and 6 car tiles. Players all flip tiles one at a time, examine them, and put them in the 10 "days" of their tile tray, in any order. Then in turn, they draw a tile from one of three face-up piles or a face-down pile. The new tile may replace one tile in their tray, with that tile (or the unused drawn tile) discarded onto any of the face-up piles. Tiles may not be rearranged. When a player has all their days connected correctly, they win the game. By Air - Two states of the same color may be connected by a same-color airplane placed between them"